The combined Russian-separatist forces attacked Ukrainian army positions in eastern Ukraine 44 times in the past 24 hours, with hot spots being concentrated in the Donetsk sector, the press center of the Anti-Terrorist Operation (ATO) reported on Monday. The terrorists fired an 82mm mortar not far from the town of Krasnohorivka. The town was also under sniper fire. What is more, the enemy used small arms, heavy machine guns and grenade launchers of various systems to shell ATO forces near the ruined Donetsk airport. The Russian-terrorist forces were also firing automatic grenade launchers on Butivka coal mine for half an hour. Ukrainian fortified positions near the town of Avdiyivka and the villages of Opytne, Pisky, Luhanske, Novhorodske, Zaitseve and Troyitske were under enemy fire, the press center said. 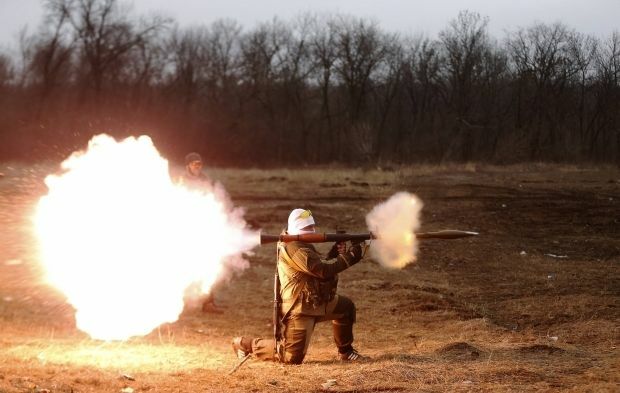 In addition, the occupiers fired grenade launchers of various systems and small arms on Ukrainian troops near the town of Maryinka and the villages of Vodiane and Zaitseve.